From artists to illustrators, photographers, writers, and publishers, American History is filled with adventurous characters who set out to document the events, people, and scenes that made this country grand. In many cases, these individuals often braved the elements, dangerous conditions, and battlegrounds to document their experiences, travels, and views, in illustrations, written materials, and photographs. 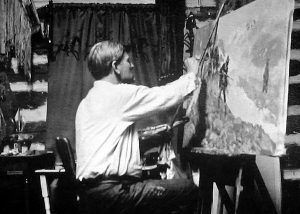 Charles M. Russell working in his studio in Great Falls, Montana. On these pages can be found many of the people and companies who documented America’s history in images and written words. 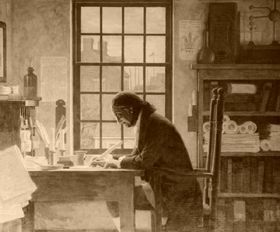 There are far too many people who have spent countless hours compiling American History to list them all; so these pages focus on some of the more famous; and, primarily on those who have “contributed” to Legends of America’s many pages. Throughout the website are numerous photographs and illustrations by some of these talented artists and photographers, as well as articles, quotes, and even one entire book, written by these historic folks. Historical Text appears throughout Legends of America. Here, you will find excerpts and full articles from historical newspapers, periodicals, and books, written in the late 1800s and early 20th century. Read the words of those who actually witnessed the frontier, its hardships, successes, from those who are well-known, such as soldiers and Presidents, to the ordinary pioneer traveling in wagons, on horses, and trains across the vast west. 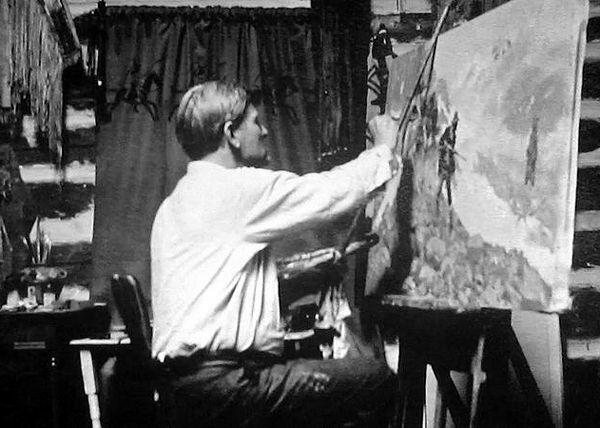 On nearly every history page, you find photographs and art from numerous talented people who left their marks through illustrations, paintings, and early photography. These artists and photographers have not given an enhanced view of our past; but, also, greatly enhanced our pages for our readers.